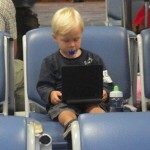 As the twig is bent..
Seen on 26-12-2010 at Phuket Airport:The boy on the photo was concentratedly busy on his laptop for at least half an hour, will he become an IT-expert in his later life? 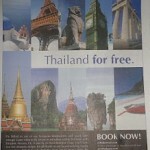 Europe for fun, Thailand for free? Seen in Patong: two young UK tourists just got their first tattoo, for ฿10,000 / €250 / $333 each. Very cool indeed. Hope they are happy with it throughout their life.